My pieces went through many incarnations and, in hindsight, I wish I had taken more photos. Firefly Design Studio’s ceramic beads were so much fun to design with, incorporating my beach glass, being able to use my favorite colors, it was all good! Because Michelle had donated such a great cache of beads, I was able to make a necklace, earrings, and a bracelet. For the necklace, I used chunky pieces of frosty white beach glass, howlite rondels, freshwater pearls, abalone beads, some asymmetrical coconut wood beads that I had in my stash, and I finished it with Vintaj Brass and leather. For the bracelet, I was able to use my new brass rivets to attach the beach glass to the Vintaj Brass focal. It is always a challenge for me to come up with unique ways to use beach glass in my pieces without breaking it! 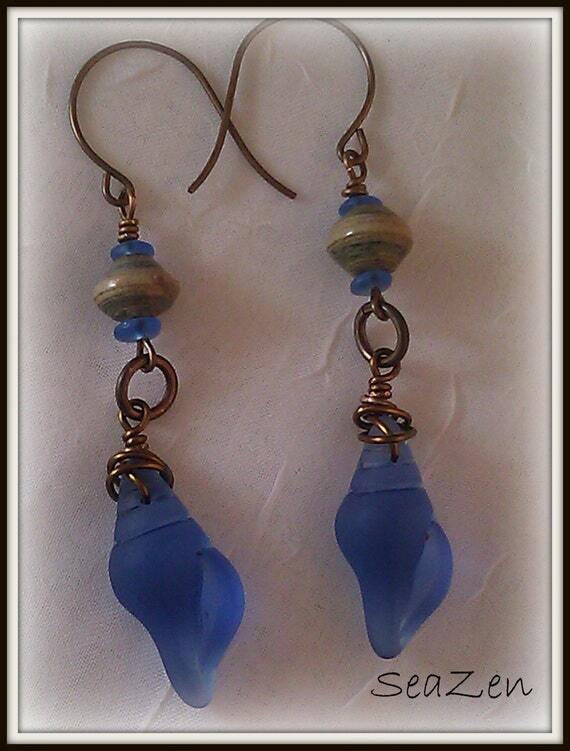 I liked the simplicity of using just one of Michelle’s beautiful ceramic beads as the focal for each earring. And, for me, it doesn’t get much better than being able to combine blue, brown, and white! So a huge thank you to all who contributed to the CBC 2000 Giveaway and especially to Michelle McCarthy at Firefly Design Studios! I so fell in love with her beads that I just couldn’t resist purchasing a few. Now to get busy with another creation! Here are the other members participating in the Thank You blog hop. Please stop by and say ‘hi’! For my first piece, I wanted to use some of my beach glass. 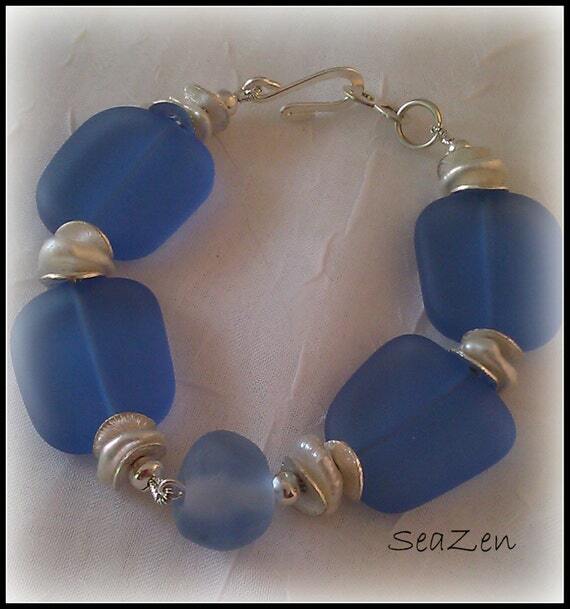 This is the main focus of my jewelry business, SeaZen, and I use authentic beach glass that I have collected over the years in most of my pieces. 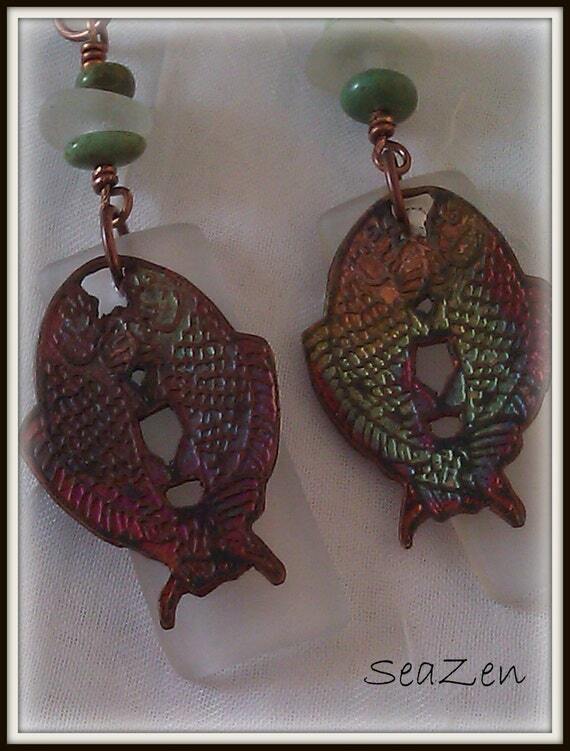 The copper fish were from a pair of vintage earrings that I have had for a long time. 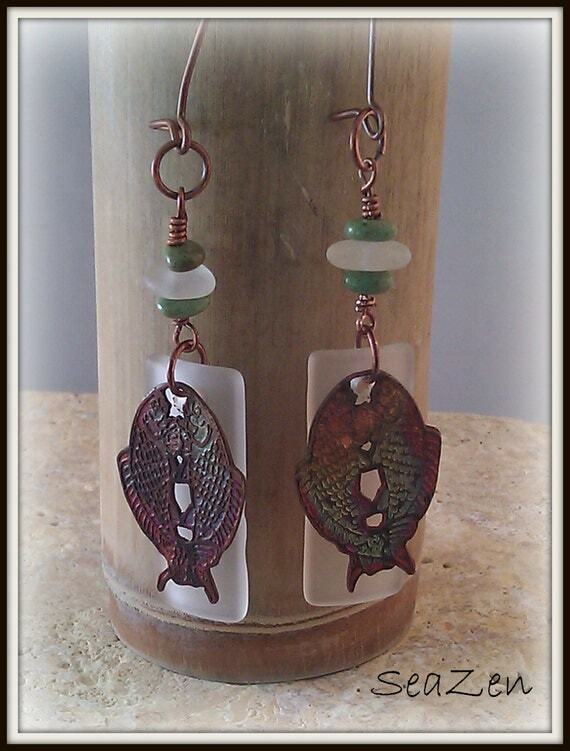 Loved the fish, the earrings not so much, so they were perfect for upcycling! I was happy with the way these turned out. On to the next pair – I absolutely love ancient Roman glass and the colors of the ZNetShows rectangles worked perfectly, kind of a seafoam green. I’ve had some African paper beads that have been looking for a home. Voila! They had just enough blue in them to match the sapphire conch shells and I liked the taupe background color with the Vintaj Brass. Three done and I still had more beads to work with! I was so happy when I opened my package from ZNetShows and saw all the blue cultured beach glass beads. Definitely my favorite color to work with! And it goes with any metal. I struggled a little with a bracelet design, but when I finally pulled out my white keishi pearls, everything just flowed. And I was so happy that I had recently received my order of lampwork beads from Pam Ferrari and had this soft blue faceted bead that was just right. I think this necklace was my favorite piece to design. 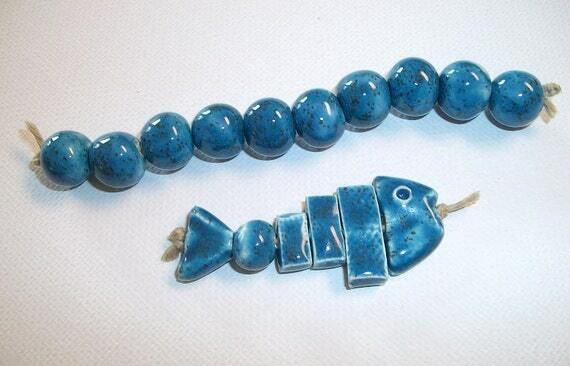 I was initially intimidated by the fish bone beads but once I got going, I had fun with it. I had a large chunk of cornflower blue genuine beach glass that was kind of rough and gnarly. It turned out to be a perfect compliment to the Raku pottery scallop shell from Star Spirit Studio. 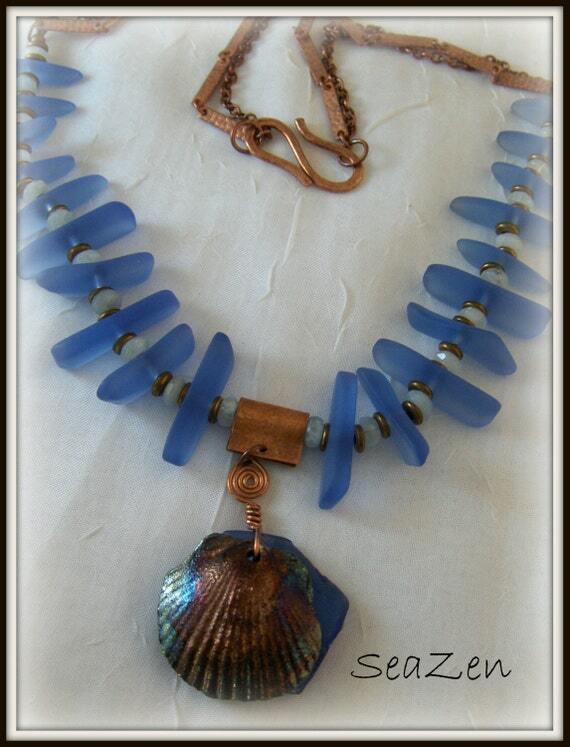 I liked the look of copper with the sapphire blue fish bones, and the cloudy aquamarine rondels softened it up a bit. All my goodies as finished pieces! 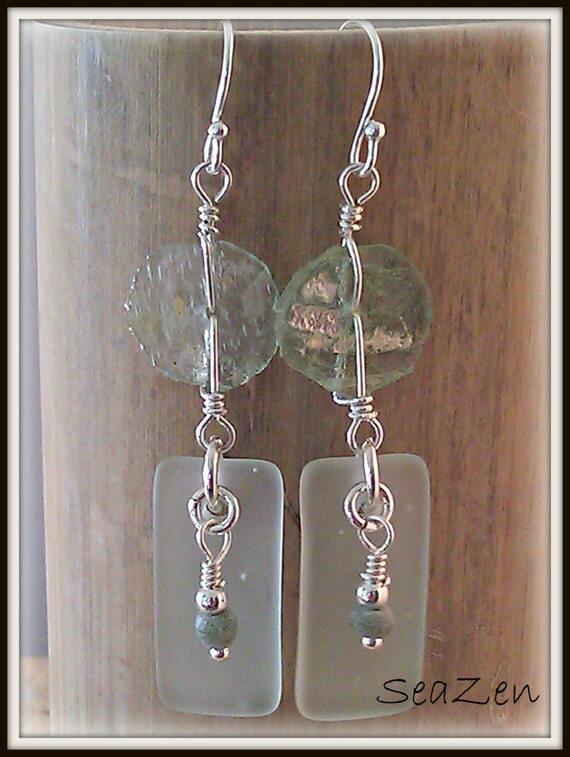 Thanks again to Bill at ZNetShows for giving me the opportunity to experiment with their cultured beach glass beads. I have already opened my wholesale account with them (they also sell retail), and look forward to a long relationship. Well, here goes nothing! I’ve been thinking about starting a blog for quite a while now and decided today to just dive in! Don’t know how often I will post but nothing ventured, nothing gained. Oh, crud – already using cliches!